Until recently, China’s demand for commodities to feed its manufacturing appetite kept resource nations like Canada, Australia and others from suffering as much as the U.S. during the depths of the last recession. Australia didn’t feel much of a slowdown and Canada’s recession was relatively short. However, the slowing of China’s economy is reported by Reuters and other news services. This will hurt resource nations like Canada because there will no longer be a cushion provided by China’s insatiable demand for commodities. a) In the first place, as I’ve said before, the Chinese ‘economic miracle’ is much smoke and mirrors. For more than a decade, China has ALWAYS achieved its growth forecasts to the decimal. That is impossible. They cook their numbers even more than the Amerikans. Nobody can consistently forecast with decimal-place accuracy year after year. Chinese growth statistics are cooked by bureaucrats to please their leaders. b) China’s bank asset bubble is so gargantuan it exceeds the U.S. The chart below from Zero Hedge shows the total Chinese bank assets compared to the U.S. Fed’s Quantitative Easing (QE) liquidity injections to Amerikan banks over the last five years. The blue line is China, the red line is the U.S. 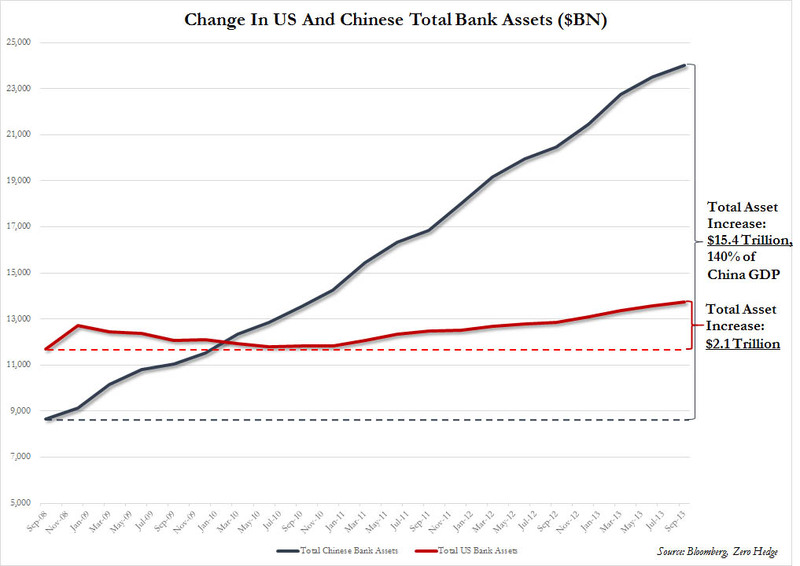 According to Zero Hedge, “in the past five years the total assets on US bank books have risen by a paltry $2.1 trillion while over the same period, Chinese bank assets have exploded by an unprecedented $15.4 trillion hitting a gargantuan CNY147 trillion or an epic $24 trillion – some two and a half times the GDP of China! More dirty laundry is coming to light: “CITIC Trust tried to auction the collateral but failed to do so because the developer has sold the collateral and also mortgaged it to a few other lenders. Bubbles burst and big bubbles burst spectacularly. c) Chinese leadership realize they are in bubble territory and are desperately trying to rein in wild, out-of-control speculation and prevent their over-heated economy from getting even hotter. They are beginning to allow bankruptcies and they hope they can achieve a ‘soft-landing’. These are the same people who allowed gargantuan bubbles to form in the first place and now they think they can engineer their gentle bursting. I wish them luck. 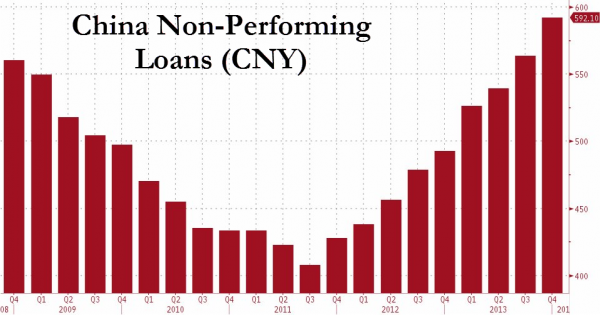 The chart below shows China’s non-performing loans increasing at an exponential pace. Zero hedge headlines it “The Pig In The Python Is About To Be Expelled”: A Walk-Thru Of China’s Hard Landing, And The Upcoming Global Harder Reset. That’s the trouble with governments; all governments. They don’t know what they’re doing and when they tinker with economies they discover the hard way that they’re playing with dynamite. One of the biggest criticisms of unfettered capitalism is the economic booms and busts that occurred on a regular basis. Yet, that ‘creative destruction’ is exactly what makes capitalism work. Today, idiot governments are trying to ‘smooth’ the extremes of boom and bust cycles, yet all they do is delay the inevitable and make the resulting bust that much worse. Forty years ago there were 50 snowmobile manufacturers. We knew that 90% would go bankrupt. We didn’t know which ones. Today there are 5 remaining. In 1908 when Ford began assembly-line production of automobiles, over 300 car manufacturers (many were ‘back yard’ operations) had already gone bankrupt leaving the strongest to survive. Can you imagine what idiotic contraptions we’d be riding today if pin-head government bureaucrats had meddled back then? The Chinese are trying to avoid Japan’s mistakes in preventing zombie companies from declaring bankruptcy because it plunged Japan into a two decade flat-line economy. The Japanese tried that, too; “building bridges to nowhere”, substituting increased government spending for falling private spending. It DIDN”T WORK for Japan. It won’t work for China. You can’t put toothpaste back into the tube. Government meddling NEVER works in the long run. China, the world’s largest ‘command economy’ – the ultimate in government meddling – is now painfully discovering they never knew what they were doing. The chickens are coming home to roost and dynamite juggling will explode (gotta stop mixing those metaphors). Keep reading for more examples. e) The failures that Rickards warned about have begun. Forbes reported that Shanghai Chaori Solar became China’s first ever bond default that was not covered over by a government bailout. For years I’ve said that the Chinese so-called economic miracle is smoke and mirrors and the chickens will come home to roost (apologies for another mixed metaphor). Command economies don’t work any better in China than they did in the former Soviet Union or Cuba or North Korea or Venezuela or Argentina. h) China Gaze reports bankruptcies are hitting ten Chinese industries: shipbuilding; iron and steel: LED lighting; furniture; real estate development; cargo shipping; trust and financial institutions; financial management; private equity; and group buying. L) Ambrose Evans Pritchard in The Telegraph quotes Zhiwei Zhang from the Chinese newspaper Economic Daily News in an article headlined “Looming property default in China raises fears of broader crisis”. 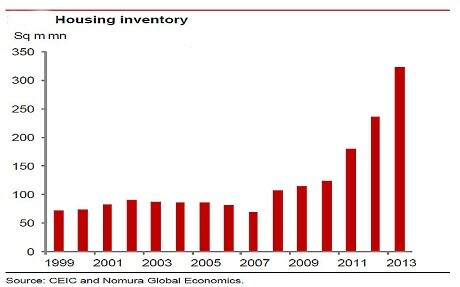 The chart below showing housing inventory is trending even more ballistic than the residential floor space chart above. The chart below is even more ominous. 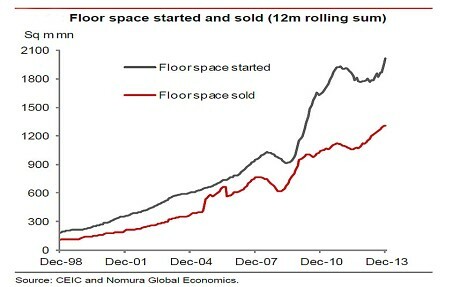 This ‘jaws of death’ chart shows the gap between housing starts (in grey) and sales (in red) is increasing. 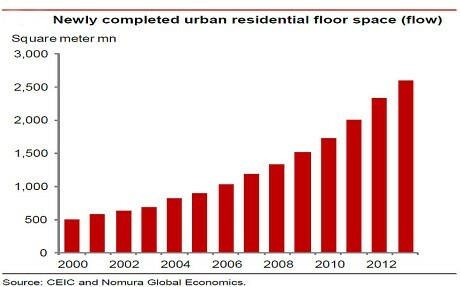 “The mounting stress in the property sector is a test of President Xi Jinping’s vow to impose market discipline, however painful. Beijing allowed the solar group Chaori to default earlier this month, the first failure on China’s domestic bond market. And so it goes. The whole world had hoped China could save us from our own economic sins. As I said before, if our only saviour is a communist country then we are truly screwed. And, resource-based nations like Canada and Australia will feel a lot more pain in the upcoming economic downturn than in the last recession because this time we won’t have China’s insatiable appetite for our resources to carry us through. Brace yourselves. We are five years into this twenty year “Fourth Turning”. We have a long painful road ahead of us. The good news is a better world will eventually emerge as the rot is expunged, but first we have to get there. This entry was posted in Collapse 2014, Economic Collapse and tagged Alasdair Macleod, Ambrose Evans Pritchard, China, China bubble, China collapsing, China real estate, China slow-down, command economy, Jim Rickards, Zero Hedge. Bookmark the permalink. Or they know what they’re doing and simply don’t care, as they’ll have gamed the system and offshored their ill-gotten wealth long before the whole system comes crashing down on the empty bag holders (i.e. the regular folks like you and me). As much as I’d like to believe all those shysters will get what’s coming to them in the end, its unfortunately likely that at least some super-wealthy and incredibly immoral individuals will have the foresight, resources and anonymity to buy up a private island somewhere and set themselves up for a very peaceful retirement while the rest of the world sets itself aflame with war and revolution. Bingo. Thought I’d add that they don’t just try to smooth out growth, but smooth it out in a way that they have continuous/perpetual growth (i.e. “modest” 2% – 3% inflation every year). This perpetual growth model is an affront to the idea that the world and everything around us moves in cycles, and will end very very badly all of us who have enjoyed 30+ years of relative stability. I used to (and somewhat still do) point this fact out about Canada, though it’s much more apt with regards to Australia. A large portion of their exports go to China, while I believe only a fraction of ours goes across the Pacific (75%+ goes down to the USA, if I’m not mistaken). I think what really saved Canadians from the last recession was the fact our debt-to-earnings levels were so low back in 2007 (in the 120% area or less I believe? ); since then, Canadians debt-to-earnings levels have skyrocketed up into the range of around 170% – 180%. Thus the next time the global economy turns down (which it’s starting to do), I think our collective Canadian goose is going to be cooked (this site needs more crazy metaphors!). Loading up on the USD yet Gerold? I’m starting to turn my attentions towards Quebec and how likely a referendum vote might be in the near future. Pretty sure that has always put downwards pressure on the Loonie… time for me to put my (incredibly small) wealth into some other currency/asset. Good comments as always, GBV. I’m undecided how much is planned and how much is stupidity. I’ve often said given a choice between explaining something as either conspiracy or incompetence, the likeliest explanation is stupidity. On one hand, the Georgia Guidestones advocate earth’s population be reduced to 500 million. On the other hand, they’d have to pretty stupid to destroy everything just to be king $hit of Turd island. I’m not sure how to play the strengthening of the U.S. dollar. Just because it’s the least ugly horse in the glue factory, I’m not sure I want to speculate on it unless I was planning on buy a lot of stuff in $U.S.. I still think precious metals are a safe way to play this. You’re right that Australia would feel more pain and sooner when China melts down. However, commodities are fungible so what happens in one area spreads world-wide. I’m working on a post about the coming Canadian Great Depression and the Chinese factor was becoming so large to make the Canadian report too lengthy to include it so I spun the Chinese article off by itself and I’ll just link it in the Canadian report. Canada will feel much pain soon and it could be energy based.